Function: Print a string in the panel. Function: Print Numbers and Variables in the plane. panel.print(a, BLUE); //Print variable a in BLUE. // Set the 1st LED to off, other 7 LEDs show GREEN, YELLOW, BLUE, PURPLE, CYAN, WHITE respectively. //Show"DF1"in the panel and flash in every second. //Fill in the display panel in BLUE and flash in every second. Function: show built-in 23 images in the display panel, number as 0~22. //Show No.3 image in RED and flash in every second. 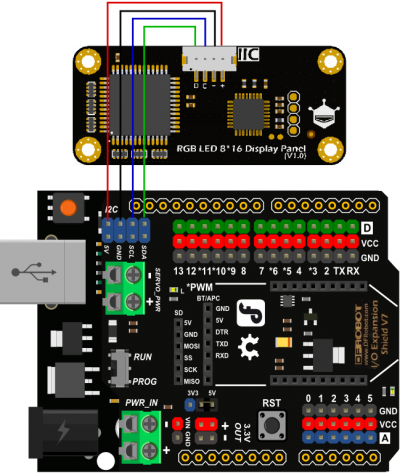 Connect hardware accoridng to the PinOut instruction, download Sample Code to the DFRduino UNO R3 (or similar), upload successfully. Then RGB Maxtrix colorful effect could be seen. Click to download libraries and examples. How to install Libraries in Arduino IDE. String s = "DFRobot";  //Define the string"DFRobot"
panel.fillScreen(RED); //Fill in the display in RED for 2s. panel.fillScreen(GREEN); //Fill in the display in GREEN. delay(2000);             //Show GREEN for 2s. panel.fillScreen(BLUE); //Fill in the display in BLUE for 2s. Result: Fill in RGB LED Panel in RED, GREEN and BLUE respectively, and show ”DFRobot”. 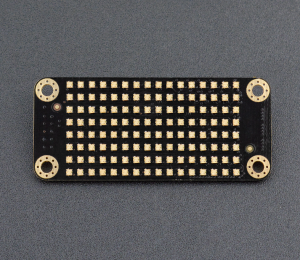 Get Gravity: I2C 8x16 RGB LED Matrix Panel from DFRobot Store or DFRobot Distributor.